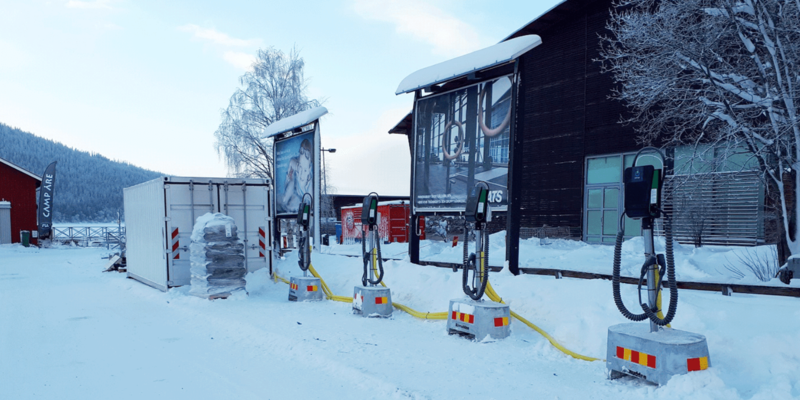 Swedish energy provider Vattenfall is supporting the Alpine World Ski Championships in Åre, Sweden, with a mobile power storage system from Beck Automation. It includes eight BMW electric car batteries and charges ten all-electric snowmobiles. The Vattenfall charging system built by Beck and powered by BMW has an output of 240 kW and a capacity of 336 kWh. The battery station serves as an energy buffer for the operation of eight charging points on four charging stations. As usual, it is designed to reduce peak loads during simultaneous charging of the electric vehicles and thus reducing the strain on the local power grid. Among other things, ten purely electrically powered snowmobiles are charged at the charging stations, transporting athletes and visitors to the sports facilities during the Ski World Cup. In addition, Vattenfall will erect around 20 temporary charging points, which will be available to the organisers. The cooperation of Vattenfall and BMW is not entirely new. They run a much larger energy storage project in Britain reportedly, where the battery system comprises six containers which contain the 500 BMW i3 batteries. They feature 33 kWh each and form a 22 Megawatt battery.